There’s no doubt that people come across the Twitter for latest trends, news, entertainment, tips, and of course for connecting with people and socializing their brand. A recent study revealed that this fastest growing network now has over 241 million monthly active users, in which 184 million are monthly active mobile users, sending over 500 million tweets per day. This demonstrates that how Twitter is going to be an overwhelming social network to tackle. When the word “Twitter” comes in your mind, you might surely think about your Twitter profile. It’s the only one thing that represents you and your reputation on Twitter, and tell people who you really are. Additionally, it plays a vital role in determining whether someone will follow you or not. 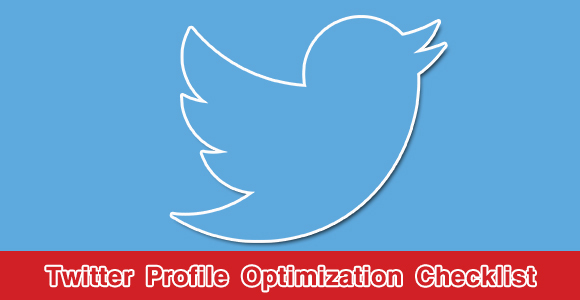 Therefore, optimizing your twitter profile is incredibly important to stand out against the crowd. From the business point of view, Twitter can be an effective marketing tool to promote your brand, generate new leads and sales, interact with your customers, and driving traffic to your business. So before you dive in Twitter marketing campaigns or paying thousands of dollars to promote a Tweet, just make sure that your company’s Twitter profile is well-optimized for Twitter’s search engine. To help you optimize your Twitter profile and make it stand out, we’ve created an infographic that will explore some of the best practices you should follow to make your twitter profile exceptional. Hope, this checklist of best Twitter practices will help you develop an effective Twitter marketing strategy, get the most out of your digital marketing efforts, and achieve the results you want. Your profile picture (81 x 81 px) is the first visual element that visitors see. Therefore, a professional profile image is a must. If your profile is a personal one, use a picture of yourself. If it's your company’s Twitter profile, use a clear and high-quality logo instead. Be sure that whatever image you use, it should represent you/your company perfectly. Your header image (520 x 260 px) is most likely the second thing someone sees. It appears behind your profile image and bio details. We suggest you to use a simple, clear and dark/muted image that suits your company’s branding. Also, you can add some brief contact info to it. Just make sure that whatever image it is, the viewer will be able to easily read the bio. Customize your background image to provide information about your company. Try to incorporate some contact information or a call to action in it. Also, keep the format PNG and size smaller than 2MB. Be sure to add the location in which you’re headquartered. This will not only help you connect with your local community easily, but also dramatically increase your visibilty in Twitter’s advanced search. As well, include a web URL where people can go to get more information about your brand. Twitter allows you to use only 160 characters to introduce yourself through your bio. Therefore, use that space properly to describe your brand, products or services. Write a clear, concise bio with targeted keywords. What comes after “@” symbol should be professional and significant, as it decides how people will find and interact with you on Twitter. Try to keep your Twitter Handle simple but effective, using your company name in it. Follow relevant people, but don't follow everyone. Follow brands and people in your industry. Follow back relevant fans especially when they engage with you. Furthermore, keep the ratio between Followers and Following respectable. Try to keep your tweets between 120 and 130 characters, so that other people can easily retweet and add a comment. The more shorter your tweet is, the higher will be the engagement rate. Limit yourself to using no more than 1-2 relevant hashtags per post. You can also hashtag a few keywords in your bio that people might search on, but don’t overuse hashtags. To stay up-to-date about your industry, knowing about your influencers and the news sources is very important. Twitter lists lets you do that, allowing you to manage your twitter profile in an efficient manner.